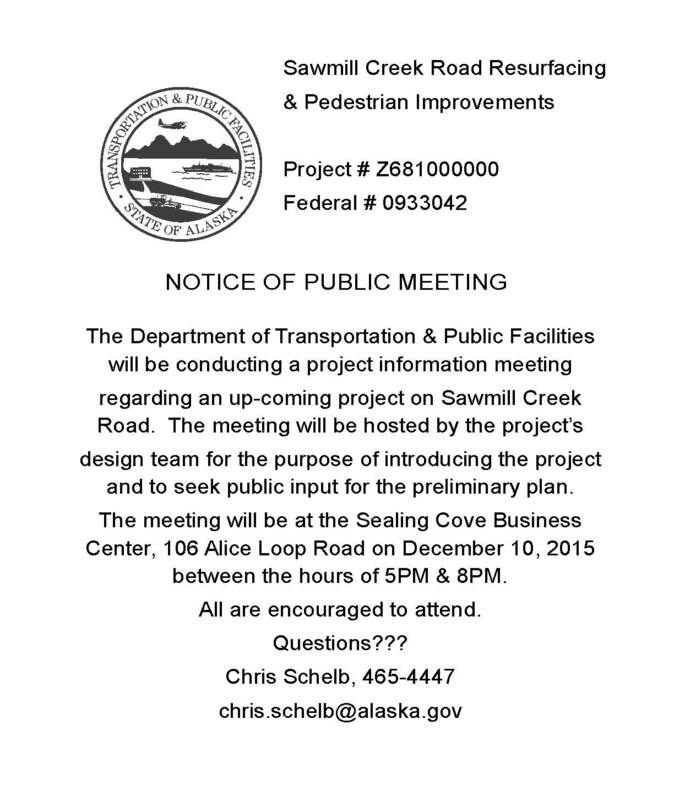 The Alaska Department of Transportation and Public Facilities (DOT&PF) will host a meeting from 5-8 p.m. on Thursday, Dec. 10, at the Sealing Cove Business Center (106 Alice Loop Road, on Japonski Island) to discuss the upcoming Sawmill Creek Road resurfacing and pedestrian/bicycle improvement project. This project has been listed on the Statewide Transportation Improvement Program (STIP) for several years, but the state was waiting for the city to finish its Hollywood Way and Baranof Road projects before starting this one. Now that those projects, which involved fixing water and sewer infrastructure below the roads, are done, the plan is to tackle the Sawmill Creek Road project starting in Fiscal Year 2017. The meeting will be hosted by the project’s design team for the purpose of introducing the project and to seek public input for the preliminary plan. For more information, contact Chris Schelb in Juneau at 465-4447 or chris.schelb@alaska.gov.